As the year draws to a close, I've spent a lot of time thinking about the past 14 months -- what I've changed, what's worked, what hasn't, and what I might do differently for next season. ("14 months" isn't a misprint: I started running 6 days a week for the spring 2011 marathon in November of 2010, and then trained straight through Ironman Wales and Ironman Cozumel. It's been real.) I changed a lot of things for this season, and most of them seem to have worked out; after plateau'ing for two or three years, this year I set personal-best times in the marathon (by 26 minutes), 10k (by 5 minutes), and half-Ironman, and I was on pace for a 1-hour+ Ironman PR until my wreck late in the bike segment. 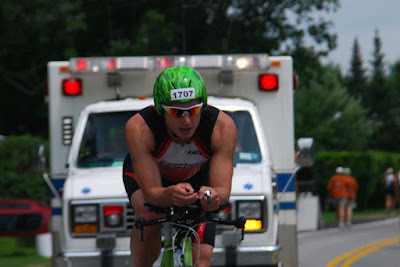 Other successes were a personal-best Ironman marathon run time at Wales, and an AG-best bike time (by 2:40) at DC Tri. I finished the year a faster swimmer, cyclist, and runner than I've ever been, and it can't all be due to the Elliptigo. It's time to take inventory, and to figure out how to finally nail that elusive Ironman. As Mr. Edison put it, "I have not failed. I've just found 10,000 ways that won't work." But what the heck: none of this would be any fun if it were easy. It's only by honestly appraising myself that I've gotten anywhere, so it's time to think things through once more. There were four broad areas of change in 2011: (1) Changes to training methods; (2) Changes to bike fit; and (3) Changes to nutrition and diet; and (4) Changes to philosophy. But, anterior to any of those, an important fact is that I headed into last winter's marathon training fully rested, because I really didn't train very hard in 2010. Last year, a bad bike wreck in May left me pretty beaten up for a month, just as the season was getting into swing, and my bike frame was broken in a couple of places. 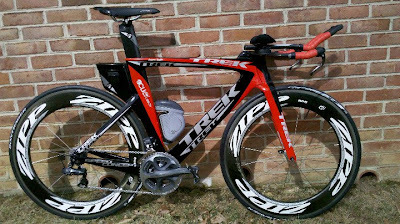 I didn't wind up getting the repaired bike back for six months -- until winter -- and, without it, my motivation to train was pretty low. For the first time in five years, I didn't race Ironman and didn't train diligently. One obvious result is that my race performance was pretty poor, but another result is that, by the time it came time to train for the Spring 2011 marathon, I was physically and mentally prepared to throw myself at the training in a way that I hadn't been in a long time. It's about training hard so the race feels easy. November 2010 to March 2011 (Shamrock Marathon training). For the first time in years, I didn't train as a triathlete. I didn't do a single bike or swim workout in those five months. I was burned out on the cycle of riding on Tuesdays, Thursdays, and Sundays, running on Mondays, Wednesdays, and Fridays, and swimming on Tuesday and Thursday mornings. That schedule had gotten me a long way, but I wanted to dedicate a few months to being a single-sport athlete and seeing what I could do if I applied myself fully to a single sport. So, I followed a pretty aggressive, 6-day-a-week running plan from Endurance Planet that really put the screws to me. It peaked at around 70 miles a week; included two track workouts, a hill workout, and a long run each week, along with "easy runs" of 7-10 miles twice a week; and featured a level of intensity I'd never experienced before. The long runs, for example, maxed out at 23 miles with miles 11-22 at marathon race pace and the last mile all-out. There was a track workout that included 8x1600 at a 6:06/mile pace. It just really crushed me, and toward the end of the program, I was struggling to hit the times on some of the critical workouts. I was getting faster, but by the end of the program, I was very tired of running all the time. Shamrock marathon went well: a 3:15, down from a prior personal-best of 3:33. Still, I'd hoped for something a little closer to 3 hours, and even though 3:15 technically qualified me for Boston by a whisker, it was unlikely I'd actually be able to register due to the new "faster qualifiers get first priority" system. So, I quickly signed up for the Eugene, OR marathon in early May, only six weeks out, to see if I could do better. March and April 2011 (Eugene Marathon and tri training). I knew I could run faster at Eugene than I had at Shamrock, but I was just sick of running all of the time. 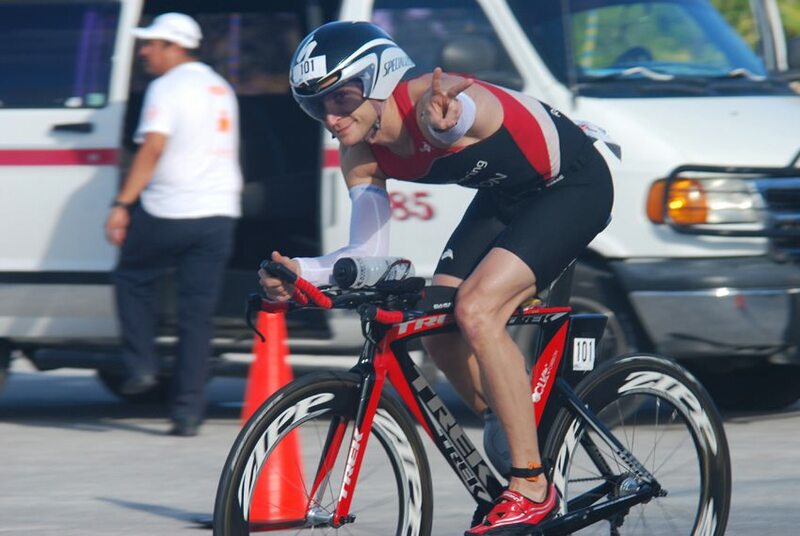 With only a six-week turnaround between the races, I knew timing would be tricky, so I decided to back off of the running volume and to start cross-training once more, i.e., training as a triathlete. I scrapped the hill workouts and fast-finish long runs, and instead threw in two hard bike trainer interval sessions each week with tough 15- or 20-minute transition runs immediately afterward. I resumed swimming twice a week. And I also started doing yoga 3x/week at work, and lifting weights regularly for the first time in years, usually a 30-minute circuit twice a week including core work, squads, pull-ups, hamstring curls, and a few other things, all with pretty heavy weight. (I also continued to commute by bike at an easy intensity: call it 75 minutes per day.) My running volume dropped from 60's per week to 30's, but I definitely felt much stronger and balanced heading into Eugene, and it showed: I ran 3:07, felt great, and grabbed a Boston slot. 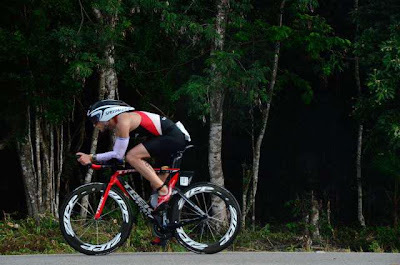 May 2011 through November 2011 (triathlon training and ultracycling). The contrast between Shamrock (where I'd been a pure runner for five months) and Eugene (where I'd run less and included cycling, swimming, lifting, and yoga) convinced me that there are many benefits to cross-training. The experience of lifting regularly, in particular, was a breath of fresh air: I just felt stronger, tougher, more balanced, and healthier. 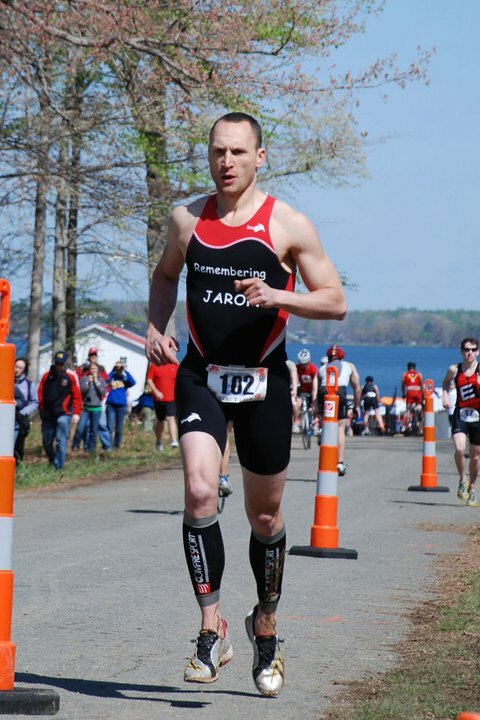 I remembered that, for the first year or two that I trained for triathlon (2005-2007), I'd hit the gym regularly, and it was only after I started to neglect strength training (2008-2010) that I'd had cramping problems in long events and encountered my plateau'ing performance issues. The yoga was also a revelation. I can't say that I enjoyed it particularly -- I found it somewhat dull -- but there was no arguing that I swam, cycled, and ran better after I started hitting it regularly. With greater hip flexibility came better extension when running, and thus more efficiency. With greater shoulder flexibility I was able to hold a narrower position on the aerobars on the bike, and I could get an earlier "vertical forearm" in the pool that in turn helped my catch tremendously. So, through the rest of the year, I made lifting and yoga mandatory parts of my regime. I also made changes to the way I trained for each individual sport. My favorite part of the swim. On the swimming front, I swam twice a week, as I'd done in past years. The problem was that, although my swimming was pretty solid, I'd felt for a long time like I wasn't making any progress. I could swim three times a week or once a week, and either way, my Z4 pace per hundred yards would settle into the low 1:20's. It wasn't much of an incentive to get up at 5:00 a.m. to swim. But this year I did find something that allowed me to have a pretty big technique breakthrough: the Swim Smooth Catch Masterclass DVD. To my mind, it has an exceedingly clear way of explaining and illustrating certain concepts I'd struggled with previously; in particular, it explains ways to think about how things should feel so that you can tell when you're doing it correctly. From watching the DVD a couple of times, two things became clear: my catch needed a lot of work (I didn't grip the water well), and I was a severe overglider (my stroke rate was far too low). I was efficient in the water, but I didn't have much propulsion, which is why my times in rough outdoor swims never seemed to live up to my times in the pool. I began swimming with a metronome with the goal of increasing my stroke rate by 10-20%, and incorporating a lot of sculling, "doggy paddle" drills, and single-arm swimming drills. At all times, I made sure to get my palms facing the wall behind me as quickly as possible. The results were almost immediate: I could cruise in Z4 at speeds approaching what my previous "sprint" speeds had been. I just found another gear. 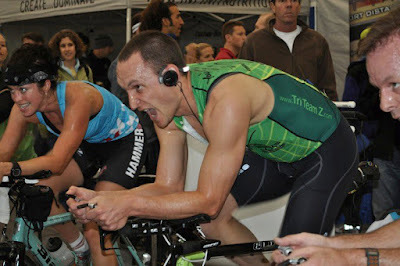 Computrainer Time Trials: You'd better go to 11. On the cycling front, things were tough for quite awhile: after not doing a bike workout for six months, I was sucking wind on even mild rides. I didn't start bike training until April, so I had to try to get as fast as I could as quickly as I could, and my approach was to crank the intensity up and hang on for dear life. Twice a week, I'd do interval workouts on the Computrainer that literally had me lying on the floor gasping at the end. My track workouts suffered a bit as a result, but I figured that, after all of the marathon training, my running would be there as long as I could get off of the bike with some snap in my legs. I've found that my running fitness doesn't readily translate to cycling fitness, but that cycling fitness does do a lot for my run. I also paid better attention to periodizing my twice-weekly trainer workouts. I let my long outdoor rides on the weekend satisfy any need I had for base training, and instead cycled my trainer workouts between pretty intense (Z4 threshold efforts) and extremely hard (Z5b Vo2-type) intervals. I rotated these types of intervals in blocks: two threshold workouts a week for six weeks, two Vo2 workouts for four weeks, and then back to threshold. The idea is is that lactate threshold is very trainable, but it takes a long time. Z5 work gives a very quick return, but the work ceases to pay large returns after a few weeks. Alternating them seemed like the perfect approach, so that's what I did. The intensity was very high, but the overall volume of cycling wasn't: I only rode long on a couple of occasions, including the Mountains of Misery double-header (78-mile Wilderness Road Ride and 128-mile MoM double-metric) and the Diabolical Double. I run faster with color coordination. On the running front, I simply discarded all extraneous volume. My miles per week figures were low -- perhaps 3 runs a week, totaling something in the 30's -- but I kept the quality from the marathon plan. My track workouts were usually 10x800, 6-8x1600, or 3x3200 at a very hard pace, and with relatively short rest. Perhaps most important, I made it mandatory to do a short transition run after every trainer workout, whether I wanted to or not. These 2-mile runs, I think, gave me a tremendous bang-for-the-buck in terms of training time, and I found myself running faster off of the bike than I ever had before. I found that it was critical to think of the runs as just part of the bike workout; if I thought of them as "bonus," I'd have a hard time getting off of the floor after the last trainer interval. One other wrinkle to my run training was that, from April through Cozumel in November, I performed all of my track work on a treadmill set to a 1% incline. When the heat is in the 90s over the summer and the humidity feels like a tropical island, it's extremely difficult to get in quality training: you're training for heat at the same time that you're trying to rip off fast intervals, and the blunt fact is that it's often one or the other. For me, it's simply impossible to run the same times when it's 90 degrees as when it's 40 degrees, and I wanted to make sure that the quality didn't suffer simply due to the temperatures. I got my heat work in, but I did so on the long runs and, in particular, during long summer rides like Mountains of Misery, the Diabolical Double, and my long August training week. I think it worked for me, and I got quite a lot of looks running sub-6:00 mile repeats on a treadmill in the Main Justice building, which is populated primarily by 50-something professional nerds. 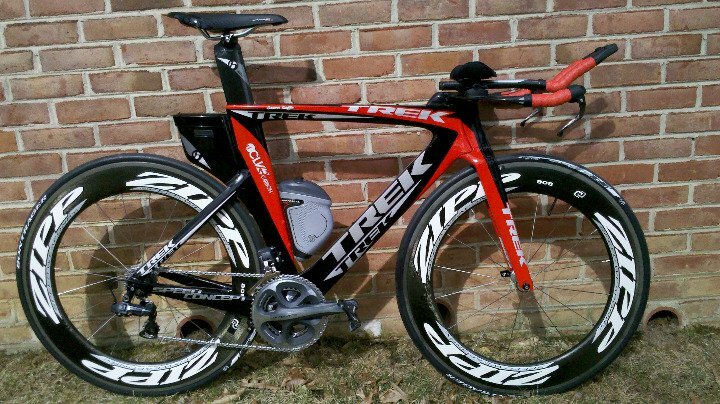 I did a lot of experimentation with my fitting before I chose the size bike and stem, because I wanted to ensure that I could get more aerodynamic than I was on my previous bike. I even took a weekend trip to California to get certified as a Fit Institute Slowtwitch (FIST) bike fitter, and while there, I had my own position reviewed by Jordan Rapp, John Cobb, and others. The result is that I got much more aerodynamic: my drop from saddle to armpads went from 9 cm to 14 cm, and my arms got narrower. Below are pictures taken in 2010 and 2011 -- the difference is obvious. 2009-2010: Wide arms, split hands, high head, wind hitting the chest. 2011. Lower and narrower, hands together, nothing extraneous. 2011 from the side. I think I can get a bit lower, but it's OK for an IM fit. Gotta get my hands up a smidge. 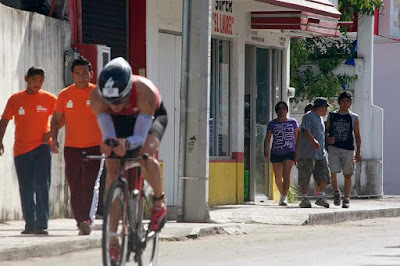 One thing I love about the new setup is the visor, which I had custom-installed on a Specialized TT helmet. It saves time in transition and affords really terrific visibility, especially out the top, which is important in my newer, more aggressive position. I'll never go back to shades if I can help it. My eating habits saw perhaps the biggest change from 2010 to 2011. I've always eaten reasonably well, but in October of 2010 -- just prior to the start of my marathon training -- I decided to do a 30-day cleansing diet. For 30 days, I drank nothing but water and green tea, and I ate nothing but salad and lean meat. I quickly came to realize that, even though I'd never eaten much fried food, I had been abusing my system in countless ways, from sucking down large quantities of coffee and taxing my adrenal system, to pounding Diet Coke and indulging my sweet tooth with gummy bears and Swedish fish. I'd grown accustomed to eating huge bowls of popcorn whenever I watched anything on tv. I'd rarely eaten much salad, and my consumption of pure water was minimal. Before every workout, I'd have gels or bars. I was, in short, a typical carboholic triathlete. The cleansing diet made me realize that I didn't need a constant glucose-and-caffeine drip in order to function. In fact, I felt streets better without those things: no afternoon crash, better mental clarity, higher quality sleep, and just feeling clean. I decided that there might be a considerable amount of low-hanging dietary fruit (sorry) if only I could figure out how to integrate a more paleo-like diet with serious endurance training. Serendipitiously, I discovered what I consider to be one of the most valuable training resources I've found in years: Ben Greenfield Fitness, including the associated podcast and books. I think the e-book he released recently, Top 20 Fueling Myths, is perhaps the best use of $7 in the endurance world, and the podcasts are required listening for anyone who takes this stuff seriously. I'd been around the Ironman world for long enough that I thought I knew the answers: make sure you eat a little bit before a morning workout, eat many small meals throughout the day to keep energy levels and blood sugar steady, have a mix of carbs and protein immediately after every workout, never risk finding yourself under-fueled, yadda yadda. After listening to the entire available library of back podcasts and reading a few of Ben's books, I've become convinced that all of these accepted ideas (and many more) are wrong, or at least incomplete, and I've made huge strides this year by often going out of my way to do the opposite of what the received wisdom would suggest. In fact, in the course of two months this spring, I went from 9.5% fat to 5.0% fat, as measured by a DEXA scan, and did it while training for 2-3 hours a day and without losing a gram of lean muscle mass. That's incredibly valuable, because estimates are that each pound of body fat lost translates into a 2-second-per-mile increase in running speed. Even if it's an approximate number, losing 10 pounds could equate to about 20 seconds a mile, or about 8 minutes in a marathon -- time that was crucial in chasing Boston. To make it happen, I changed a number of things from the way I'd always done them. Godzilla salad plus grilled chicken. I have a big refrigerator. First, I changed my nutrient intake. I viewed food as fuel, not pleasure, so I changed what I ate and ate less of it in general. I cut out processed food, fried food, refined sugar, and grains almost entirely. That includes eliminating soft drinks completely. No more sandwiches with sun chips and a Diet Coke for lunch. No more personal pizzas. Instead, I lived off of salad, fruit, and lean meat. My strategy for doing this was pretty simple: each week I'd make a massive salad in a serving bowl. I used organic ingredients wherever possible, and these salads truly covered all of the bases. A typical one would be a massive amount of baby spinach, topped with red peppers, mushrooms, carrots, cucumbers, tomatoes, black beans, apples or pears, walnuts, almond slices, and a sprinkling of chia seeds. I'd also grill up a few pounds of organic chicken breast or wild-caught salmon. Each day, for lunch, I'd pack some salad (to which I'd add avocado each day, to avoid browning) and some lean meat, occasionally with guacamole. That would be lunch. chicken breast with guacamole, and apple slices with hummus. Given that most of my intense workouts occurred right after work, I also brought some light snacks for the afternoon. On the day pictured to the right, these snacks comprised a bag of organic apple slices ($1 at Costco) with an individual-size package of organic hummus ($0.25 at Costco). Finally, I would include a Living Fuel Supergreens shake, which is about 400 calories of the cleanest, most nutrient-dense nutrition one can imagine. I found that, by eating lunch around 1:00, and then having the shake and apples with hummus about 3:00, I was ready to cruise by 6:30 or so, when I'd have my treadmill workout and bike ride home, or my ride home and then Computrainer brick workout. I've never measured precisely, but I think this stuff is probably on the order of 1300 calories. That might sound like a lot for lunch and a snack, but I consumed less per day than it implies, due to change number two. Second, I changed my nutrient timing by practicing regular intermittent fasting. The notion of fasting is probably anathema to many endurance athletes, who often are accustomed to eating constantly for fear of underfueling. But it turns out that there are myriad health benefits to periodic fasting, including significantly reducing blood cholesterol levels, triglycerides, weight, blood sugar levels, and risk of coronary heart disease. This is not an outlying article: for a thorough discussion, Mark's Daily Apple provides links to countless other other articles and the underlying studies, including ones that explain that calorie restriction is convincingly correlated with increased longevity. Counterintuitively, fasting even triggers the release of a flood of growth hormone. 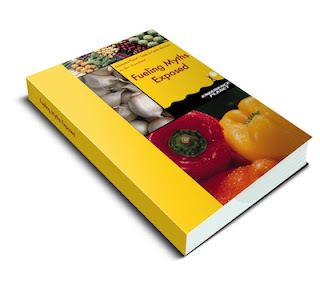 Perhaps best for endurance athletes, it teaches your body efficiently to burn fat as fuel. Here's an interesting, accessible read that dispels many myths about fasting, and other worthwhile articles can be found here, here, and here. If I got hungry, I'd drink some water. 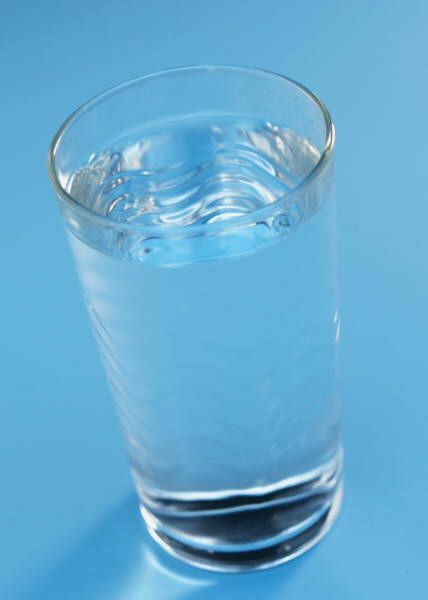 Mmmm, water. So, fasting and calorie restriction seem to be healthy. But as an endurance athlete, I knew I needed to fuel myself. That's why I decided to give intermittent fasting a try. Intermittent fasting is what it sounds like: instead of fasting for a day, or a week, one fasts frequently for shorter (but still meaningful) periods. The Leangains website explains several different ways that one can integrate an intermittent fasting regime into a training regimen, but there are some common threads, including a fast of 14-20 hours each day, including for a couple of hours before bed. I went from 9.5% to 5% body fat in two months, and lost literally zero lean muscle, by practicing intermittent fasting, plus eating nutrient-dense food, for five days a week, 16 hours a day. In practice, this would mean I'd have a moderate dinner, typically salad plus lean meat, at around 8:30 at night (after my evening workout). By 9:00 p.m., I'd be done eating, although I could still have water and tea. I'd go to bed around 11, then wake up at either 5:00 (for morning swim) or 7:30 (for days with no swim). In either case, I'd have a cup of coffee (because the caffeine is helpful to rev up fat-burning metabolism), and water, but no calories. I'd then swim (or not), pack my lunch, and bike to work at a leisurely, fat-burning pace. At work, I'd sometimes attend a light yoga session, and otherwise would have water and tea until 1:00 (16 hours after 9:00 pm). I'd then eat lunch (salad and meat), and then my afternoon snacks (Living Fuel shake and apple with hummus) before my hard evening workout, after which I'd have an early dinner. That's it. On the weekends, when there are longer rides and runs, I'd eat normally -- no fasting here, because it's important to recharge every now and then -- but I'd still try not to eat for a couple of hours before bed, and I'd sometimes go on long rides with about half the number of gels I usually take. The purpose, as always, was to teach my body to burn fat efficiently. Green tea: No longer just for green-tea drinkers. I expected a lifestyle of intermittent fasting to be tough. And, indeed, sometimes it was. But I discovered a number of benefits beyond the fact that weight fell off of me like water. A chief benefit was that, in order to stave off hunger, I'd drink huge amounts of, yes, water (which I never had before) and green tea. These quell the appetite very effectively, and they're hugely beneficial in their own right, including for weight loss. 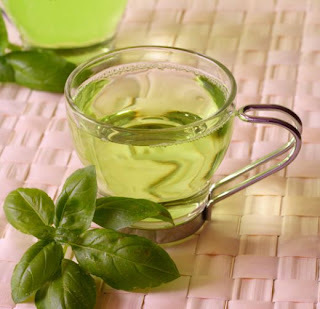 Green tea, in fact, is very nearly a miracle substance for fat-burning and health generally. Second, although sometimes I felt a little sluggish, overall I felt amazingly good -- light, clean, and generally just better. Hunger wasn't a cause for alarm; instead, I viewed it almost like a familiar companion, a sign of progress. The biggest challenge was starting the tough afternoon workouts, be they track or trainer. I'd often find that, even though I'd eaten a good amount a couple of hours before the workout, my blood sugar wasn't where I wanted it to be; during warmups, I often suspected that I'd have to quit halfway through the first interval because I just wasn't feeling it. Almost every time, however, once I dug into the workout and got my blood pumping, I'd find myself just crushing it. I had to force myself to fight that initial mental battle, but once I did, the results were simply incredible. In addition to the paleo-esque diet and intermittent fasting, I adopted a well-researched and fairly extensive supplement regime. Each day, I'd take the following: fish oil, Vitamin D, magnesium, CapraColostrum, Extreme Endurance, CLA, cayenne pepper, green tea extract, resveratrol, acidophilus, evening primrose oil, coenzyme Q-10, and beet root powder. Finally, the last aspect of getting to race weight was just living with an eye on the goal. I work on the fourth floor of a building with very tall floors, and I never took the elevators. At restaurants, I'd stay away from the bread baskets and desserts, except for the occasional unadorned berries. And heck if it didn't all work a treat: in February, I weighed 170 pounds; in late April, 157 pounds. I drifted into the low 160's during tri season, but the feeling of lightness and power remained, and my results showed it. 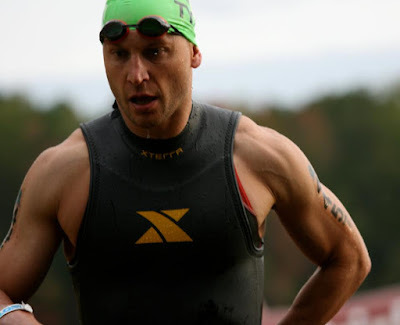 The last big thing I changed in 2011 is that, for most my most successful races, including the Oregon marathon and Ironman Wales, I raced purely on feel: no wattage, heart rate, or pace. I ate when I wanted nutrition, drank when I was thirsty, and generally just tried to relax and absorb the feel of the race. In Eugene, I wanted to run under 3:10, so I ran with the 3:10 pace group for the first 10k, and then picked up the pace a bit, and just ran by myself for the last 20 miles, taking what the course and my body gave me. On a couple of occasions, I saw race clocks and literally looked another direction as I ran by, because I simply didn't want to know what my time was -- I'd go as fast as I could go that day, no more and no less. But I wouldn't let my brain get in the way by seeing a time that was "too fast" or "too slow." The result: a 3:07, good for an 8-minute PR and a Boston slot. Sometimes, in races, ignorance is bliss -- and maybe a ticket to a P.R. I took the same approach at the Musselman half-IM. I raced the sprint hard on Saturday, and then raced the half on Sunday on a very hot day. Despite the heat and a very hilly run course, I managed a 4-minute run PR for the distance, again with no watch. And I repeated the feat in Wales, smashing my run PR by 40 minutes after one of the hardest bike rides of my life. I don't think that this is coincidental. I'm a believer in specific training, whether by wattage or pace or heart rate, because training sessions are designed to push us a certain amount, no more and no less. If the object is to execute a threshold run, it is not better to run faster than threshold -- it simply generates more stress on the body and inhibits recovery. Races, though... well, those are different. There, the question really is, how fast can you go? And what I'm realizing is that sometimes I can go faster than I'd think, but only if I don't let my head get in the way. In my post on 10 Ironman Tips, I provided Ken Mierke's article on the Hedonic Mode of racing, where he talks about "focusing on feeling, not on numbers." I find that, when I wear a watch or have a computer, I'm constantly looking down and trying to figure out whether my numbers are "right," or attempting to manipulate them in a certain fashion. In doing so, though, I think that sometimes I fail to listen to what my body's telling me, and I'm realizing that the body knows what's going on inside it better than any computer ever can. When I don't wear a watch when I run, I notice animals, kayakers, other athletes, and whether I'm thirsty; when I do wear one, I'm often so focused on the digital display that I can't remember half of what happened in the race. That's a shame, and it's one I'm not going countenance in the future, especially when it might slow me down. 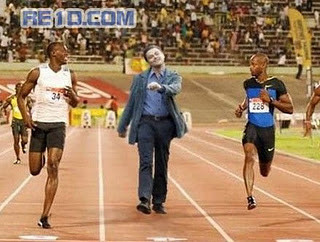 So, that's how I got faster in 2011. In the works: what I plan to change for 2012. Damon, very useful post. I have made similar changes to my diet and seen similar changes in body fat, although admittedly with much less research behind the changes. Can you post some details about your strength circuits? Exact workouts, intensity, etc. I've been following some suggestions from the guy who runs platinum fitness that are on a cycling blog, and more guidance would be very useful. Thanks! Congratulations on a year of PRs. I love that your Type A-ness can benefit others (like me) when you share your lessons learned as you have here. Thank you, DT. Bilal: My strength workouts usually comprised 2 circuits of the following exercises, each done with a weight that yielded something very close to exhaustion on the last rep. I think this worked very well, but I'm going to change some things up for next year -- less use of machines, more TRX. Great post Damon - I'm going to look into the swim DVD you talked about because I'm having some of the same issues you outlined. Congrats on a great year and thanks for sharing your insights. If you ever want someone to do TRX with, I am always looking for a buddy - I hate doing strength training by myself. Really enjoyed the post overall, especially the diet segment. I went further back to other posts and really enjoy your writing style. One comment on shedding the measurement devices (GPS, stopwatch, power meter etc). I feel this is valid for experienced athletes but beginners and even intermediates don't have a feel for how hard "hard" is or how easy "easy" is. Beginners sometimes get the idea that "I don't need all that gear, I'll just use PE". Possible but not a recipe for early success. Watts, thanks, and I fully agree with your comment. I decided in the blog simply to be honest about what's currently on my mind, and what's working (or not working) for me. It may work for others, or it may not; as you observe, there are too many variables to account for, and I'm not attempting to be Joe Friel. For example, the last thing I'd want is for someone on the team I'm with to tell a coach that I recommended that people should starve themselves. I'm just telling my story a bit; if it helps people, that's great, but even if people don't structure their lives and training as I do mine, I hope that, from time to time, there will be ideas worth considering. I know that you're a lawyer and, therefore, likely to choose your words carefully. What do you mean when you write "I cut out...grains almost entirely"? All grains or just most of them? Have you kept any as a guideline/rule? I know that there's some debate about quinoa being a grain/seed (I'm not really interested in that debate); what, if anything, does Ben Greenfield have to say about quinoa with respect to including/excluding it from a diet? Dave: I say I cut grains "almost entirely" because it wasn't done dogmatically. It wasn't because I thought grains were toxic or anything; instead, I just thought they were empty calories. So, on the weekends -- i.e., on days when I was slightly recharging calorically -- I'd sometimes have a couple of pieces of bread for toast, but I'd ensure that it was made from soaked and sprouted grains, which generally is available at Whole Foods. Greenfield's general philosophy is that grains are often harmful if eaten without soaking and sprouting them, because they contain proteins that interfere with mineral absorption and other things. In practice, this means a fair amount of work soaking and sprouting your grains (what he and his wife do), or shopping very specifically. After his interview with William Davis ("Wheat Belly" author) a couple of weeks ago, however, I think he is now leaning toward cutting out wheat almost entirely, regardless of how it's treated. As for quinoa, he'd say that it's fine as long as it's soaked and sprouted and eaten in moderation. FWIW, all of this stuff is degrees of perfectionism -- it's his job to give the most correct advice, and let people decide exactly how perfectionist they'd like to be. I've learned quite a lot from him this year.